CELEBRATING 11 YEARS OF ARTS-MENTORSHIP IN EAST AUSTIN! 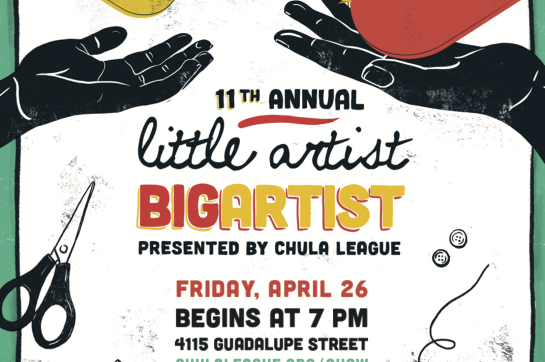 Grounded in East Austin, Chula League, producers of Cherrywood Art Fair, and Mondo are partnering to present the 11th Annual Little Artist BIG ARTIST Benefit Show. This unique benefit show, hosted by Mondo, will feature works of over 70 artists (Little and BIG) from Chula League’s arts-mentorship program, Little Artist BIG ARTIST. The opening reception is on Friday, April 26 at 7 PM. Celebrating 11 years of arts-mentorship, guests will dance to music, be merry with drinks and eat some delicious bites during the reception. Attendees will have the option to bid on each of the 41 Little Artists pieces, starting at $50 each, and enjoy music, drinks with light refreshments. The funds raised at this event will go back to each of the six participating East Austin Elementary schools, keeping true to Chula League’s mission in fueling and sustaining the arts in East Austin. In addition to the silent auction, T-shirts and donation opportunities benefit Chula League’s Little Artist BIG ARTIST mentorship program. Launched in 2007, Little Artist BIG ARTIST is a unique mentoring experience that pairs professional artists with fifth and sixth graders from East Austin elementary schools. During the ten-week, one-on-one program, each Little Artist will create two art pieces. BIG ARTISTS provide their time and draw upon their experience as working artists to teach their Little Artists how to turn their ideas into art, and their art into a business. With the support of the Austin community, Chula League is able to foster the evolution of local artists through their Little Artist BIG ARTIST mentorship program, Professional Development workshops - Cultivate, and by offering affordable art events such as Cherrywood Art Fair. 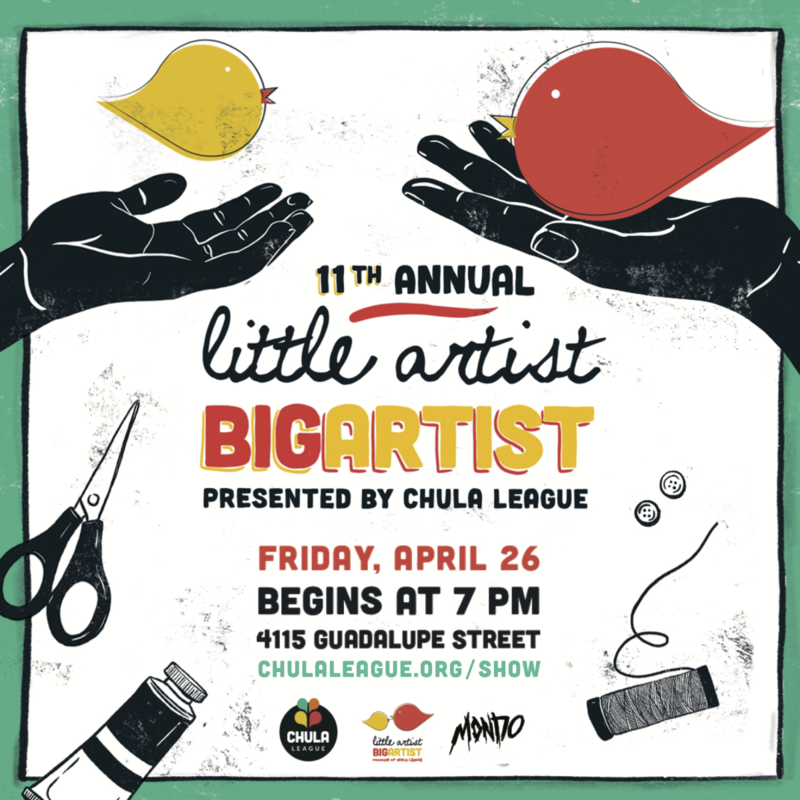 Join Chula League and Mondo at the 11th Annual Little Artist BIG ARTIST Benefit Art Show on April 26, and help empower the local art scene.